"Why are you doing this? You know you've never had a moustache!" What if you shaved off a longtime moustache, and no one noticed? Does that mean it was never there? 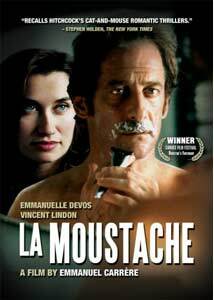 Marc Thiriez (Vincent Lindon) appears to have a great life with a loving wife and an attractive home. But everything goes haywire when he decides on a whim to remove his moustache. Expecting to receive comments from his wife Agnes (Emmanuelle Devos) and their friends, he's stunned when no one says a word. Marc's bewilderment increases when she claims strongly that he's never worn a moustache. Are his friends playing an elaborate trick on him? Is Marc going crazy? Searching for the answer will take him around the world and only increase the growing confusion. Adapted from his novel, Emmanuel Carrere's La Moustache provides hints about Marc's situation but avoids any simple answers. Shot with a low-key style and focusing on the lead characters' mental states, this film avoids cheap tactics and presents the story with a deliberate pace. While Marc grows increasingly agitated by his wife's denials, she pushes him to seek professional help for this malady. Who is right? It's possible they're both correct and a science-fiction element is controlling the events. Their deteriorating relationship appears in realistic fashion, which only increases the sad nature of his confusion. Marc locates vacation photographs that appear to prove his statements, but they inexplicably disappear. Carrere appears to show us where they've gone, but even this image is unreliable. By providing very limited information, he risks alienating the audience by also increases our interest in the final outcome. The picture's first half effectively utilizes the clever premise and gives few clues regarding the mystery. Lindon and Devos convey good chemistry and feel like a married couple, even when major trouble ensues. Her character's behavior is frustrating because our view is aligned with Marc's. But the story's progression makes sense when taken from a realistic context. If this situation occurred in your life, family and friends would probably act in similar fashion. Unfortunately, the second half falls short of equaling the intrigue of the earlier moments. Once Marc journeys to Hong Kong and begins to meditate on his situation, we expect at least some type of worthy revelation. Instead, he spends considerable time doing nothing, which lessens the intensity of the past sequences. The final act of La Moustache includes a surprising transition that could enhance your understanding or create further confusion, depending on your perspective. I admire Carrere for pulling the rug out from under us, but this risky move also tested my patience. I'm a big fan of stories that don't reveal everything and leave questions open for viewers to contemplate. The story's end did give me a possible solution, but several issues appear that seem to contradict that theory. The success of Carrere's approach will depend on your willingness to enjoy the ride and discover your own solution. The second-time director deserves credit for crafting a unique, imperfect story that differs considerably from expectations. In similar fashion to Marc, our questions have increased after the last frame, which could lead to more frustration than wonder. Image Transfer Review: La Moustache provides a solid 1.85:1 anamorphic widescreen that effectively presents the story's confining indoor spaces. The colors are fairly grainy, but they rarely detract from the overall production. Few defects exist on the screen, and the image quality remains acceptable throughout the film. Audio Transfer Review: This release provides a quiet listening experience with a consistent 2.0-channel Dolby Surround track. This movie includes considerable dialogue and eerie music, and they spring well from the front speakers. It is unfortunate that we don't have a 5.1-channel transfer, which would have enhanced the overall effectiveness, but this version performs acceptably. Extras Review: La Moustache would have seriously benefited from a director's commentary, but it does provide two 20-minute extras that offer some worthy details. The better entry is an interesting conversation between Editor Camille Cotte and Writer/Director Emmanuel Carrere. They discuss the eerie feeling when viewers remembered filmed scenes that were removed from the picture. These moments would have slightly clarified the story, but the tone of other scenes actually recalled the unseen events. The other 20-minute supplement is a typical behind-the-scenes featurette, which includes comments from the director and actors during filming. It's intriguing to note that even star Emmanuelle Devos had little understanding about the plot's intricacies. The remaining features include five additional previews for other Koch Lorber releases and this film's theatrical trailer, which utlizes a 1.85:1 widescreen transfer. La Moustache offers one of the year's most intriguing premises, but its execution falls short of providing a spellbinding experience. The acting is solid, and the story remains interesting while we seek an answer, but the overall result is only partially satisfying. It receives a mild recommendation for viewers willing to take the metaphysical ride.